Their body is fusiform or more commonly known as (spindle-shaped). The animals forelimbs are modified into flippers in order for the animal to propel itself through the water. The tiny hind limbs are vestigial; they do not attach to the back bone and are hidden within the body. The tail has horizontal flukes. The Cetaceans are nearly hairless, and are protected by a thick layer of blubber. The order Cetacea contains just over eighty species divided into two suborders, Baleen whales and toothed whales, which includes dolphins and porpoises. 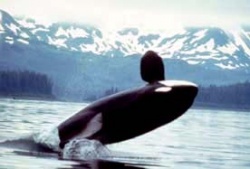 Cetaceans have no voice but many produce distinct sounds used in mating rituals, communication, and echolocation. Such sounds are specific in character and many are made for distances of a kilometer or more. Bats and cetaceans are the only mammals known to echolocate; they use sound emission and echoes to form mental images of their environment and surroundings. Cetacea exhibits many different kinds of behavior. Some of their behaviors include Breaching also known as lunging and porpoising, spyhopping, lobtailing and slapping. These often are exhibited by many different species of Cetacea. A breach or a lunge is a leap out of the water. The act of leaping or beaching is the most powerful act that any non-human animal can perform. The distinction between a lunge and and a breech are very obvious. A lunge is when 40% of the animal's body clears the water, and the breach is with less than 40% clearance. More clearly stated, a breach is a jump with an intent to clear the water as much as possible, whereas a lunge is the result of a fast upward sloping swim, sometimes as a result of feeding, that has caused the whale to clear the surface of the water by accident. Spyhopping is the act of coming out of the water vertically. As powerful as the order Cetacea is a individual can spyhop as much as half of its body out of the water. The reasons for spyhopping are likely to be similar to those of breaching. On the other hand, this method is used for examining its surroundings above the surface. Lobtailing is the act of a whale or dolphin lifting their tail fluke also known as "front flippers," out of the water then bringing it down onto the surface of the water hard and fast in order to make a loud slap. Like breaching, lobtailing is common among active cetacean species such as Sperm, Humpback, Right, Orca and Gray whales. It is less common, but still occasionally occurs, among the other large whales. Porpoises and river dolphins rarely lobtail, but it is a very common among oceanic dolphins. It seems that lobtailing is more common within species that have a complex social order than those where animals are more likely to be solitary.